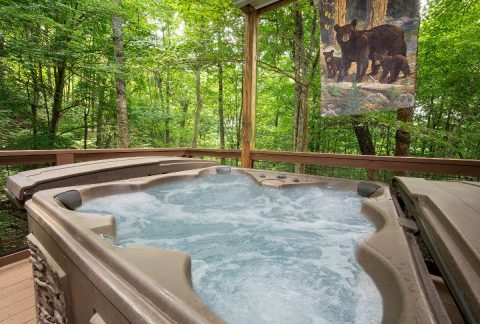 Located in the scenic Sky Harbor Resort area, you'll find "A Bear's View" an affordable 2 bedroom cabin that sleeps up to 8 guests in the Smoky Mountains! 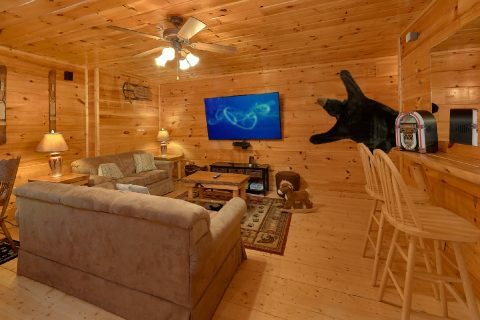 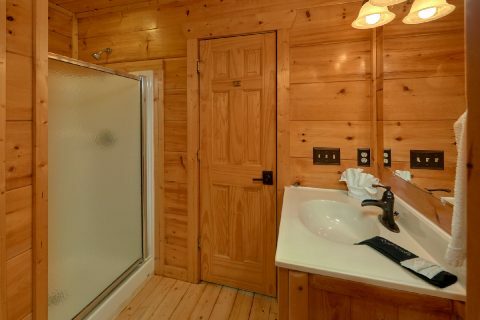 With a great location near top local attractions and excellent amenities like a game room with a foosball table, this log cabin is perfect for enjoying the Smokies in comfort and style. 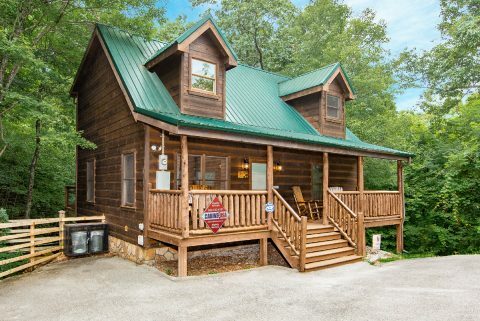 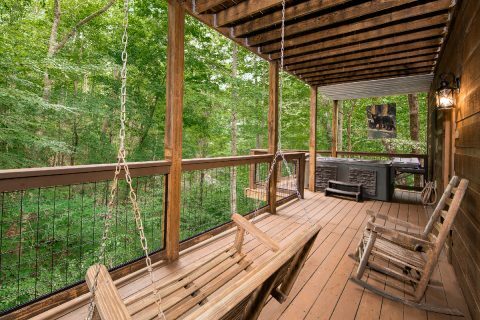 Since this rental rests a short drive from the scenic Spur Road that connects Pigeon Forge and Gatlinburg, this rental boasts a great location for accessing attractions in either city like Dollywood or Anakeesta Gatlinburg. 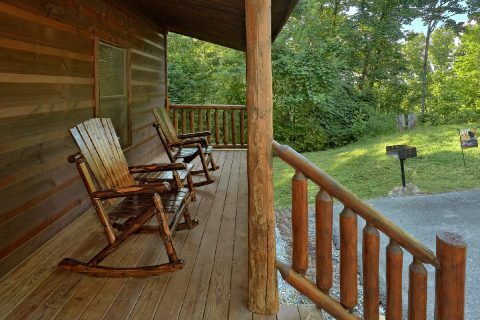 Other nearby destinations like the Great Smoky Mountains National Park are also only a short drive from this cabin, so you can easily spend your day hiking to waterfalls or looking for wildlife in the Smokies! 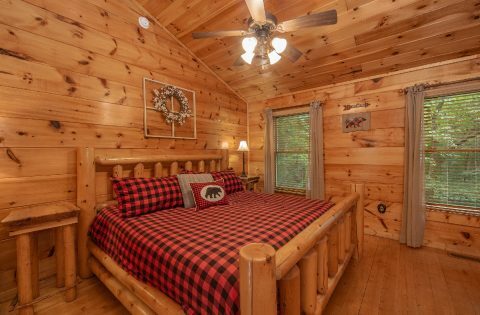 When you return to your cabin after a great day exploring the mountains, you'll be glad you reserved this comfortable cabin for your vacation! 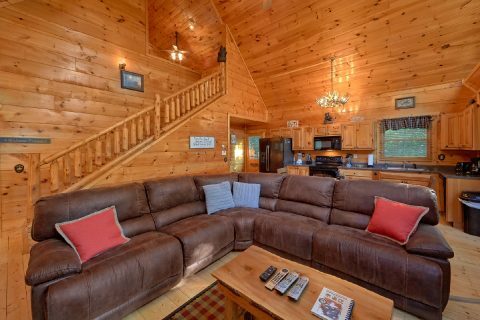 The main living area is an open space with high ceilings, comfortable furnishings, a fireplace, a 65" television, and large picture windows that showcase your cabin's beautiful setting. 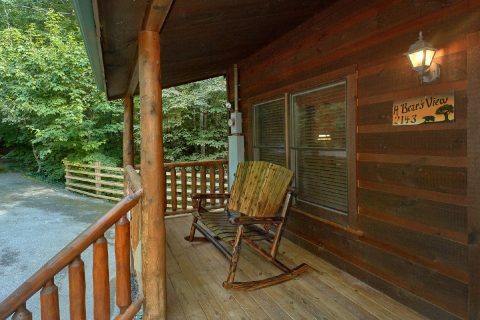 From here, you can step onto your cabin's deck to enjoy the fresh mountain air and take in the forested view. 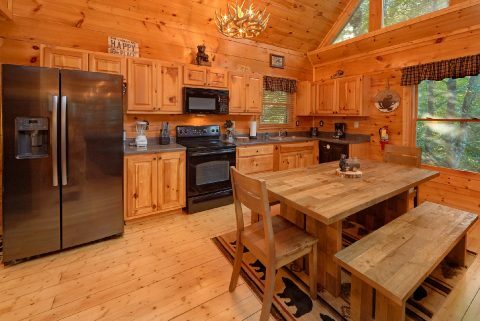 This level is also home to a full kitchen and dining area, so you can save on your vacation costs by preparing delicious meals in your cabin during your stay. 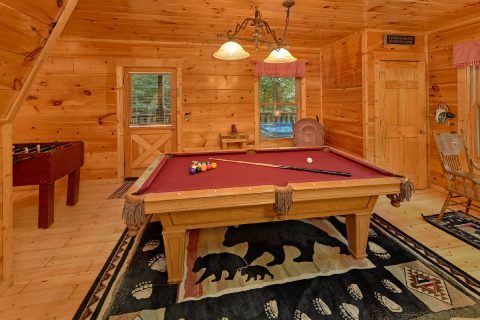 For some friendly competition, you can step down to your cabin's game room to enjoy the pool table, Poker table, multi-game arcade machine, or foosball game. 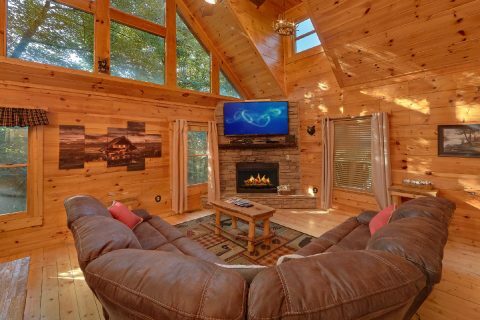 There's also a 75" television in the game room, so you can watch your favorite team play while you work on your pool shot. 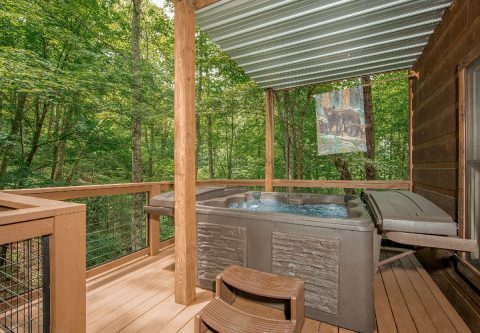 This level is also home to a deck with a hot tub, so you can take a soothing dip surrounded by the sights and sounds of nature. 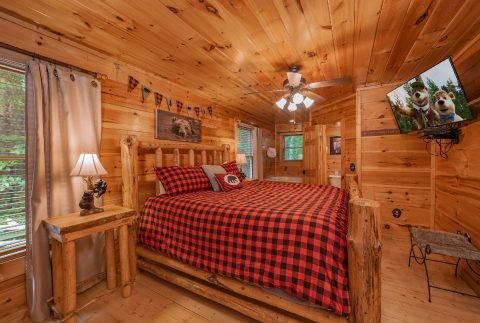 Once you're ready to get some rest, you can look forward to sleeping in one of this cabin's 2 private bedrooms. 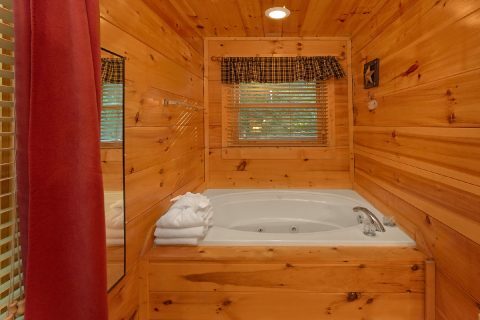 The main level bedroom provides a king bed, an in-room jacuzzi tub and private television. 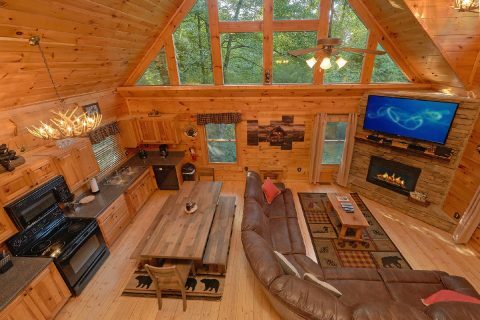 The upper level loft bedroom also provides a king bed, a television, and a private bath. 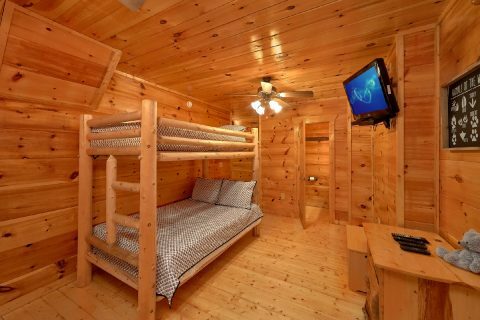 With a twin-size bunk bed in the game room and a sleeper sofa, this cabin can accommodate up to 8 guests, so it's just the right size for a family vacation or a fun getaway with friends! 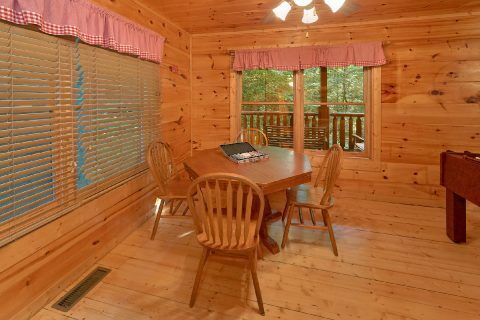 This cabin also provides WiFi Internet for you to use during your stay! 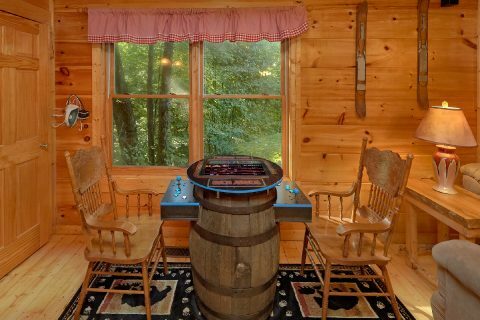 Book this affordable cabin with a foosball table today with Cabins USA Gatlinburg and you'll save 15% on your lodging with our special cabin discount!